I set these challenges because I think we often get bogged down in day-to-day work, and it’s useful to join a club like this that pushes us to try new things. There will be challenges to get you more creatively writing, drawing, video making, designing and all sort of other things. They’re monthly, because we’re all busy, and this is something we can all commit to. Scroll down the page, and you’ll find links to past tasks to complete at your own pace (or you can pick and choose the stuff that looks good). The resulting thing doesn’t need to be good, it’s about playing with it. Van Gogh was probably crap the first time he tried painting. Taking part is fun, but also a good opportunity to think about things a bit differently. Share your efforts! And chat to people who have shared theirs! We’re all going to keep each other motivated and inspired. If you haven’t already, sign up here to receive the newest #CommsCreative challenge in the monthly email newsletter. Once you sign up, on the first Monday of the month you’ll be all set to get the latest challenge, as well as inspiration, tips, case studies, and all the good stuff on creative communications and social media. Share your work with the #CommsCreative hashtag, and tag me @HelReynolds too, so I can see your wonderful creations. Find other people working on their #CommsCreative challenge on Twitter and Instagram to see what everyone is up to! Don’t forget to share this page with colleagues and friends who want to try new creative techniques so they can join in too. You’re going to a make a sketchnote, and it doesn’t matter if you can draw or not. Think of a problem and try to visualise it. A very useful activity! Create a calligram. I did a Christmas one, but it can be on any subject. 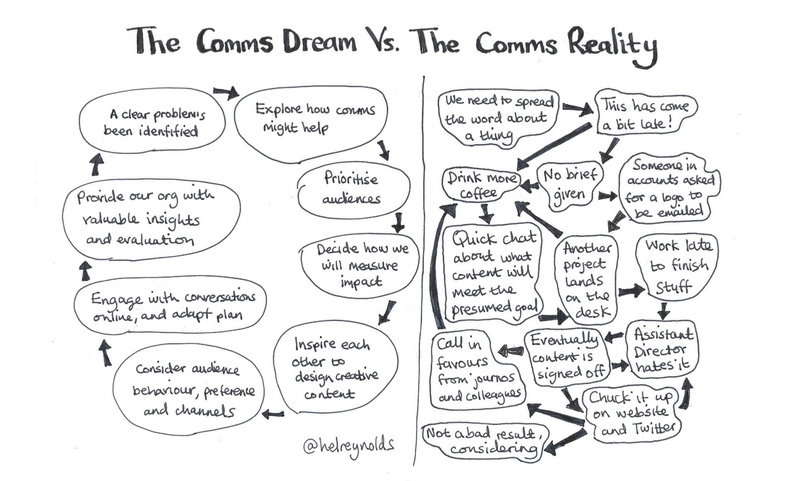 Visualise your comms style. The way you do things is your secret creative sauce – be proud. Sign up to the Comms Creative newsletter to find out first! Not all these tasks are accessible for people with physical impairments, but some will be, and I hope you can take part in some or all of these. I have psoriatic arthritis and I know that drawing isn’t an option when sometimes my hands are swollen or sore. In those thankfully rare cases, I might use Canva to make an graphic instead of doing a drawing, or maybe even structure words on a page in an or visual way interesting way. Perhaps if you find you can’t take part, you can offer an alternative version of the task that I can share with others?